​We reserve the right to refuse the sale of our puppies to anyone, at anytime for any reason. • “Hold” for a puppy that a deposit has been received for that preliminary matches buyers criteria but is still waiting on eye color determination, evaluation, and final pricing. • “Sale Pending” for a puppy with a final cost established and accepted by the buyer. • “Sold” for a puppy which full payment has been received. ​Keep in mind that puppies identified with a "Hold" or "Sale Pending" can become available again in the future if someone passes on a advance deposit hold or is unable to complete the purchase agreement in anyway. A $250.00 deposit is required to hold your puppy of your choice. Buyers who wish to place an “advance deposit” on a future litter are placed on a "litter priority list" on a first come first choice basis in the order we receive the deposit and signed purchase contract. Advance deposits are 100% refundable less any applicable transactions fees (i.e. PayPal fee, wire transfer fee, etc) until a specific puppy is chosen. Advance deposits are applied to the purchase price of the puppy. Advance deposit buyers are given pre-choice of their puppy based on the buyer’s initial choice preference as defined in the purchase contract (i.e. coat color, gender, and eye color) before the puppies are made available for sale to others. Upon the birth of a chosen litter, advance deposit buyer(s) will be notified in the order of their placement on the litter priority list within 3 - 5 days of birth. 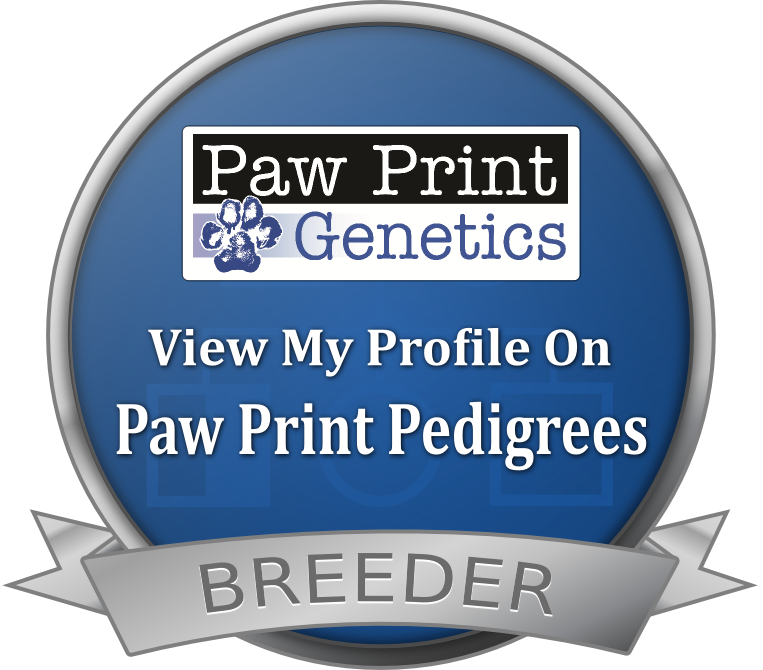 First buyer will be provided specifics and pictures of any available puppies within their defined preference. At this time buyer has been provided a “choice option” and is given 24 hours to choose a specific puppy to continue to wait for final cost determination, wait for the next litter (if next litter is due within six months), or request a refund of their deposit. Once this decision is made, the next buyer on the priority list will be contacted with current availability and provided the same options. The same will apply for others on the priority list. Pre-chosen puppies will be recognized as “Hold” on the website. Note: Once choice option is given, if a response is not received within 24 hours; priority list order and choice option is revoked and the next buyer on the priority list will be contacted accordingly. Once final evaluation and cost determinations are completed (usually within 4 - 5 weeks), priority list buyers who have provided “advanced” deposits will be contacted for final purchase considerations and confirmation. Final purchase decision confirmations are required to be received within 24 hours. If a response is not received within 24 hours it will be assumed buyer is not interested in purchasing the puppy and applicable refund will be issued. Puppy will be placed back into an “available” status. Once choice option is confirmed for purchase, deposit is no longer refundable. Deposits received after a litter is born are not refundable. All puppies are sold as pets and without breeding rights. If you desire to arrange breeding rights this must be discussed and mutually agreed upon by buyer and seller at time of purchase. Additional fees will apply. If you have any questions please do not hesitate to contact us. Let us know what you are looking for, what your current home environment is like and we will be happy to review each available puppy in detail with you so you can make a solid decision on your new companion. We want you to be confident and comfortable in your choice during the process. If you are interested in purchasing a puppy from an existing or future litter, please email us or call to confirm puppy availability. We require a $250.00 deposit per puppy that is non-refundable unless you are placing an advance deposit on a future litter as explained above. The deposit is applied towards the purchase price and deducted from the remaining amount due. Choice of puppy is on a first come first choice basis once deposit and signed purchase contract is received. Please keep this in mind when choosing your method of payment and sense of urgency in returning purchase contract. The deposit and purchase contract indicate your intent to purchase a puppy. If for any reason you are unable to meet the terms and conditions of this contract we will retain 100% of the deposit and any payments received. Puppy purchase balance is due 10 days prior to picking up or shipping your puppy. Or you may pay the remaining balance in cash on the day of pickup. Shipping cost must be paid in full prior to us making any arrangements for shipping. Puppies are not released prior to 8 weeks of age and are required to be picked up no later than 9 weeks of age. Additional fees will apply for retaining the puppy on behalf of client beyond 9 weeks of age. We accept cash, money orders, certified check, wire transfer, Paypal, credit card (via Paypal), and personal check (which must clear the bank before pickup). Paypal is a very secure method for deposits, payments, and/or to pay the entire purchase price of a puppy. Signing up for an account is simple, it’s free, and allows you to pay with a credit card if you prefer which is safe and secure. If you have a Paypal account you can use our email address kelli@keldrewranch.com to make a payment directly to our account. The Paypal payment method requires that you add an additional 3.07% to the payment in order to cover Paypal’s transaction cost. Pickup: Contact us 2 weeks prior to pickup to arrange a day and time for pickup. We will provide directions and any additional information at this time. Local Texas Delivery Service: Depending on your location we can arrange to deliver and meet you at a pre-determined location. Additional fees will apply to be determined, agreed upon, and paid in full 10 days prior to delivery. ​Any other type of transportation or delivery cost, if any, are at the cost of the buyer and must be prepaid before shipping. We will send you weekly puppy progress updates and pictures via email and/or custom owner specific FaceBook page. In addition, all puppies leave with a new puppy care package. Purchase terms and conditions are subject to change without notice at anytime.